Events have answered a question that I posed last year here on Parliamentum on 24 May 2018. I wondered, “Will Wade MacLauchlan Become the First Premier to Ignore a Fixed-Date Elections Law Twice?” Yes. 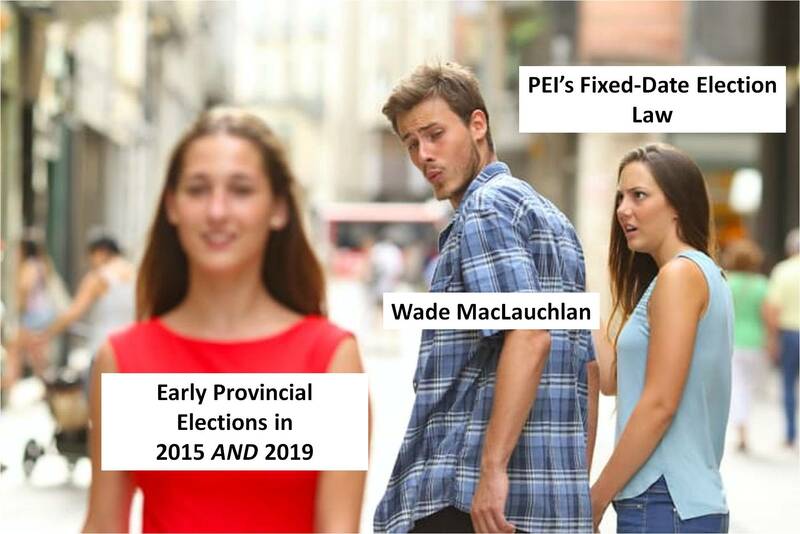 Wade MacLauchlan has become the first premier in Canada to ignore a fixed-date elections law twice, once on 26 April 2015 (as I wrote contemporarily in “The Mandate Problem: Early Dissolutions and Fixed-Date Election Laws in Prince Edward Island and Alberta”) and again on 26 March 2019. I also included that prediction on page 77 of my thesis “Reining in the Crown’s Authority Over Dissolution: The Fixed-Term Parliaments Act of the United Kingdom versus Fixed-Date Election Laws in Canada” in September 2018. Indeed, four years have passed since the Island’s previous election, and Canadian parliaments and legislatures traditionally last around 4 years. So what accounts for all this bad timing? What made these two early elections necessary? In short, Prince Edward Island’s Election Act says that if Premier MacLauchlan had not advised an early dissolution before October 2019, then the provincial general election would have happened instead in April 2020 – thus forcing that 65th General Assembly to live out its absolute maximum lifespan under the Constitution Act, 1982. MacLauchlan’s early election and four-year General Assembly thereby prevented a late election and a five-year General Assembly. second, that they necessarily preserve the established constitutional positions of the Governor and First Minister under Responsible Government and thus mean that the Governor dissolves the legislature on and in accordance with the First Minister’s advice, apart from some exceptional circumstances in minority legislatures which do not apply here but which did apply in British Columbia in 2017 and New Brunswick in 2018. Nothing in this act affects the powers of the Lieutenant Governor, including the power to dissolve the Legislative Assembly, by proclamation in Her Majesty’s name, when the Lieutenant Governor sees fit. Section 4.1(2) fixes the election to the first Monday in October every four years, starting in 2011. Like Manitoba and Saskatchewan, Prince Edward Island had to respond to the fallout of the early federal general election of 2011. In December 2013, Liberal Premier Ghiz confirmed in Question Period that his government would introduce legislation in the next sitting modelled on the Manitoban and Saskatchewanian amendments. This law would allow Prince Edward Island to hold its next general provincial election in April 2016 so that it does not coincide with the federal election. The first provincial general election scheduled under section 4.1(2) of the Election Act occurred in October 2011. The second fixed-date election should therefore have been scheduled originally for October 2015 but then, applying this new provision, should have been postponed to April 2016. The 64th General Assembly should therefore have been scheduled to live for four and one-half years instead of four years, from October 2011 to April 2016. But it did not. This is because Premier MacLauchlan by-passed the whole process. The Liberals enjoyed a comfortable majority in the 64th General Assembly, elected in 2011, and Robert Ghiz decided to resign as party leader and Premier mid-parliament. The Liberal Party of Prince Edward Island then acclaimed Wade MacLauchlan as leader on 21 February 2015, and the Lieutenant Governor appointed him Premier on 23 February. However, MacLauchlan was not a sitting MLA. This might explain why he opted for early dissolution rather than serving as an non-MLA Premier for over one year until the next scheduled general election. Under the Heardian viewpoint, here two constitutional conventions came into conflict: the contrived “convention” that First Ministers can only advise early dissolution and by-pass a fixed-date election law if the government has first lost a vote of confidence in the assembly, versus the legitimate, well-established convention that the Premier should be both an Executive Councillor and an elected MLA. A Premier under those circumstances would probably face fewer accusations of democratic illegitimacy by advising early dissolution than by adhering to the scheduled fixed-date election, and so MacLauchlan cut the Gordian Knot and opted for an early dissolution on 6 April 2015; after a writ of 28 days, the general election on 4 May 2015 also yielded a Liberal majority in the 65th General Assembly. However, MacLauchlan faces a second Fixed-Date Election Problem: the 65th General Assembly is also scheduled to last for longer than four years. The legislation schedules the next provincial election for October 2019, but since that would coincide with the scheduled federal election, the law would postpone the provincial election to April 2020 and thus push the 65th Assembly perilously close to its absolute maximum lifespan of five years (4 May 2015 to 4 May 2020), as prescribed in section 4(1) of the Constitution Act, 1982. With a writ of 28 days, MacLauchlan would have had to advise the Lieutenant Governor to dissolve the 65th General Assembly on Monday, 23 March 2020 so that the general election could have been held on Monday, 20 April 2020. This 65th General Assembly would certainly have become the longest-lived elected assembly under a fixed-date election law if MacLauchlan had allowed it to run out the clock for another year. Even though the Island passed its fixed-date election law in 2008, eleven years ago, events have conspired such that the province has held only one general election in accordance with the schedule contained in the Election Act. After Islanders elect their 66th General Assembly in April 2019, their next general election would be scheduled for October 2023 – and then postponed again until April 2024 if the federal election scheduled for October 2023 would also still happen. Therefore, the strong possibility remains that the Island’s fixed-date election law would schedule the 66th General Assembly to last for its absolute five-year maximum yet again; at minimum, it would schedule the upcoming 66th General Assembly to last four and a half years instead of merely four. This absurdity cannot continue. The Legislature of Prince Edward Island should repeal section 4 of the Election Act – this stupid fixed-date election law – entirely and revert back to what the law said before 2008. Prince Edward Island would boldly go where no province has gone before and re-join the ranks of Nova Scotia, currently the only one of the ten provinces which never passed a stupid “fixed-date” election provision in the first place. Alternatively, if the 66th General Assembly truly and sincerely believes that Wade MacLauchlan’s two consecutive early dissolutions demonstrate something other than the futility and redundancy of fixed-date election laws, it should at the very least make this new quadrennial vernal pattern official and amend section 4 of the Election Act for the third time and schedule the Island’s general elections for spring 2023 and every fourth spring thereafter, perhaps for mid-May or early June. The spring and early summer serve as the best time of year for holding elections in Canada anyway: more daylight and warmer temperatures provide more opportunity for campaigning and door-knocking and for happier party volunteers and election workers. Ontario recently switched its scheduled elections from early October to early June for these reasons. I’m quite pleased to have correctly predicted that MacLauchlan would opt for an early dissolution in the spring of 2019 instead of allowing the 65th General Assembly to prolong itself for an extra year. On some level, I also wonder whether I made it happen in some sort of operationalization of Heisenberg’s Uncertainty Principle. By definition, we’ll never know! But at least we do know that my grasp of these issues and analyses of these laws are sound and true. Will Wade MacLauchlan Become the First Premier to Ignore a Fixed-Date Elections Law Twice? Prince Edward Island, “Proclamation: Dissolution of the Legislative Assembly,” Royal Gazette volume 145, no. 13 (Charlottetown: 30 March 2019), 347. Kevin Bisset, “Prince Edward Island Election Called for 23 April,” CTV News, 26 March 2019. Prince Edward Island, Legislative Assembly. An Act to Amend the Elections Act. Bill 9, 63rd General Assembly, 2nd Session, 2008. Premier Robert Ghiz, [“Oral Questions: Provincial Election Date”] in Prince Edward Island, Legislative Assembly. Hansard, 64th General Assembly, 4th Session, 3 December 2013 (Charlottetown: Prince Edward Island Legislative Assembly, 2013), 658. Prince Edward Island, Legislative Assembly. An Act to Amend the Election Act. Bill 34, 64th General Assembly, 4th Session, 2014. Prince Edward Island, Election Act, Chapter E-1.1, 23 December 2017. Elections Prince Edward Island, Report of the Chief Electoral Officer for the Provincial General Election, May 4, 2015 (Charlottetown: Legislative Assembly, 7 October 2015), 7. New Zealand’s (coalition) PM is the first sitting Head of Government to give birth – Out of Wedlock – while in office. Um, ok??? What does this have to do with anything? Yeah… I’m not interested in blogging about gossipy nonsense steeped in moral judgement, so I suggest that you create your own blog and write about it if you think that it will get you re-tweets and readers. Yes we’ll then why don’t you pick up on my Order in Council PC 1940-1121 that “seconded/merged/usurped” the Clerk of Privy Council into one job along w the Secretary to Cabinet – All reporting to the PM— the Executive Power cannot be controlled by the Legislative power, at least not under 1867, and notwithstanding 1931 or 1947 or 1982 it still prevails. Now that is a scoop! Do you realize that the Prime Minister by virtue by his appointment — by the Governor General — to The Queen’s Privy Council For Canada and as Prime Minister, becomes a Member of the Executive Branch and Principal Advisor to the Governor General? therefore, the Legislative Branch (The Queen represented by the Governor General, the Senate and the House of Commons) had nothing to do with the Order-in-Council 1940-1121. Secondly, and more importantly, in the Westminster system of Parliamentary Democracy – Responsible Government form of government, the Legislative branch — the Parliament, specifically, the House of Commons — holds Her Majesty’s Government, also known as the Government of the Day — to account is a Constitutional convention, not Constitutional Law. Therefore, I do NOT see how your “scoop” could be seen as an usurpation of the Executive Branch by the Legislative Branch. I wonder whether or not you realize that the Cabinet is a committee of The Queen’s Privy Council For Canada? The Prime Minister and the Ministers of The Crown in Right of Canada are Members of The Queen’s Privy Council For Canada, and therefore, are part of the Executive Branch. Justin Trudeau and the 29th Ministry constitute the Executive Government of Canada, and are the Principal Advisors to the Governor General. In regards to Michael Wernick, the former Clerk of the Privy Council and Secretary to the Cabinet, the fact he had testified that he was in fact pressuring Her Majesty’s Attorney General For Canada on the SNC-Lavalin affair was absolutely despicable, and I am glad that he realized that and resigned. It was absolutely wrong for Prime Minister Trudeau to use the Clerk in a partisan fashion, and Wernick realized that there was no way the opposition parties would trust him. Dear sir, I believe you are describing the UK system that Wm LM King so desired to construct here. There, (no written constitution) the Executive is incorporated into the Legislative but our “similar in principle ” power-sharing system #1 is written, #2 is hierarchical with the Executive as a superior and separate power and #3 is not being followed. It is not being followed because of the emergency wartime Order in Council PC 1940-1211 (the Privy Council office today has this noted as their”Enabling Legislation ” on their website. I believe very few of us were politics- following adults in 1940 and no one has the personal memory to advance an opinion on the times or the actual before and after in the “differences in practices” as a result of this Order. I believe what has evolved today into a combined PMO-PCO Court-of-the-King did not begin on March 25,1940 but gradually assembled itself and drew power unto itself and it absolutely the opposite of what the Framers of the BNA 1867 designed. Their is no separate and superior Executive, the Governor General exercises ‘de jure’ NONE of the s.12 powers that are re-stated in the 1947 Letters Patent and the Privy Council is NOT a set of independent advisors to the Governor General as specified in S.11. Please join the few of us who have actually read PC 1940-1221 and after examining it, sit down and RE-read the Executive Power section of the BNA/Constitution 1867 . Further, ponder why Wm LM King required that Order? And why at that time? Do you know that the Clerk who advised Byng to NOT grant King a dissolution in 1926 was the same Clerk (Lemaire) who was retired on Jan 1, 1940? And you recall the terrible wartime events in the UK in the last Qtr of 1939 and first Qtr of 1940 – they had better things to do than countermand the orders of an uppity Dominion PM who was to be the vital link in mobilizing his country to aid so ably in defending the Realm. Yes. It was necessary – but 1940-1221 should have been rescinded in peacetime. But who would do it? An opposition Party Leader- no s/he wanted a chance to wield that absolute power to pay-back his supporters. The Clerk/Secretary – no s/he kept her/his mouth shut. You or a million other educated but not informed students of Parliamentary Law? How could you -you were never taught! Two final questions- first, what does “similar in principle” mean? and second, why, if the BNA /Const 1867 (and its predecessor the Constitutional Act of 1791) is laid out with a separate and superior Executive, do we not have this hierarchy today? Why not? PC 1940-1221 is why. Dear old Canada had its colonial Responsible Government local system amended in 1867 by adding another layer of the same Responsible Government atop the 4 provincial ones. And now it is impossible to amend-with-100% these foundational aspects of our arrested-in-development Written Constitution – so we must reform them with non-Constitutional measures. We must restore the as-written 1867 Act and return the Legislative Power and office of PM to its place as Chief Operating Officer and restore the Executive and office of Governor General To it’s place as Chief Executive Office. We are not emulating any other country – we are following our own unique system of written laws- and if we cannot, will not or are not compelling our government to follow our own unique system of written laws how can we call them to account? If the government is not following the written laws…. what laws ARE they following.